Now that the tide of outsourcing employment has begun to turn, the time has come to think about how to reverse chronic unemployment among youth in the United States. Newman (Sociology/Univ. of Massachusetts, Amherst; The Accordion Family: Boomerang Kids, Anxious Parents, and the Private Toll of Global Competition, 2013, etc.) and Winston (Investigative Journalism/Brandeis Univ. ; Unchosen: The Hidden Lives of Hasidic Rebels, 2005) note that economic cost structures have changed, as large corporations—e.g., Wal-Mart (which will buy “an additional $250 billion in US-made products over the decade that began in 2013”), General Electric, and Apple—are working to bring jobs back home. But what kinds of jobs will they be, and who is qualified to take them? Well-paying jobs, for workers with the right kinds of skills, remain unfilled even now, but 50 percent of youth are unemployed. Therefore, expansion of technical education must be on the agenda, argue the authors. In the U.S., however, vocational/technical schools are often viewed as inferior to traditional four-year colleges or even a dumping ground for those without futures. The authors compare America's practices with those in Germany and Japan. In Germany, where youth unemployment is 7 percent, there is no such cultural stigma. Corporations, government, and labor all work together to develop curricula and training programs to qualify potential workers, and they offer long-term employment stability and high wages. Newman and Winston point out that America's manufacturing prowess used to be the envy of the world, but the stigma against technical education helped to erode that status. 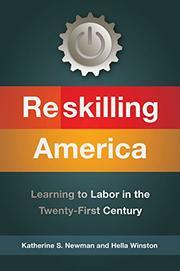 Reviewing America's attempts to establish a consistent framework for vocational and technical training, the authors document the negative consequences of warping youth's ambitions against skilled employment. The upcoming presidential election makes this a vital time to bring these questions, not otherwise addressed in this way, to the fore. A top-notch, highly accessible contribution to the business and popular economics literature.